Active Ingredients per 1.0 ml: Whole Hemp Plant Essential Oil 15 mg (0.5 mg/drop). Total of 375 mg of phytocannabinoids per bottle. Dosage conversions: 1 drop contains 0.5mg of Oil. 1 ml (1 full dropper) is 30 drops of Oil, which is 15 mg of Oil. Initial dosage for the first 7-14 days: 1 drop per 11 lbs (5kg) of body weight of your pet twice daily. If your pet doesn't respond as you were hoping after 7-14 days, then you can increase the amount you are giving to 2.5 drops per 11 lbs (5kg) of body weight of your pet twice daily (MEDIUM dosage). until you are giving as much as 5 drops per 11 lbs (5kg) of body weight of your pet twice daily (HIGH dosage), which has been found to be helpful for most pets. Safe use in pregnant animals or animals intended for breeding has not been proven. If animal’s condition worsens or does not improve, stop product administration and consult your veterinarian. An examination from a veterinarian is recommended prior to using this product For Animal Use Only Keep out of the reach of children and other animals. In case of accidental overdose, contact your veterinarian immediately. Do not use if tamper-evident seal is broken or missing. Refrigerate after opening. Use within 90 days of opening. Packaging: 0.83 oz bottle. Each bottle contains 750 drops. 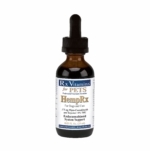 I have 2 pets with 2 different conditions on HempRx For Dogs & Cats and both have seen positive benefits! I highly recommend it and definitely plan to continue using it!